BUDAPEST, Hungary (October 23) -- Olympic champion Erica WIEBE (CAN) and three-time world champion Adeline GRAY (USA) both missed last year's World Championships. Both showed they are back by reaching the semifinals with come-from-behind victories in their quarterfinal matches on Tuesday at the World Championships in Budapest, Hungary. The two wrestlers will now meet in the semifinals at 76kg. Wiebe trailed 2014 world champion Aline FOCKEN (GER) 4-2 with less than a minute remaining in the match before getting a takedown to take the lead on criteria. She added another takedown with 10 seconds remaining to seal the victory. Gray found herself in a 6-3 hole with a minute and 30 seconds remaining in her quarterfinal match against Elmira SYZDYKOVA (KAZ) before she secured a takedown and ran the Kazakhstan wrestler over for the fall with just over a minute remaining. On the top side of the 76kg bracket, reigning world champion Yasemin ADAR (TUR) was unscored open in the opening session, picking up a 10-0 technical fall in her first match and following it up with a 7-0 victory in the quarterfinals over Hiroe MINAGAWA SUZUKI (JPN). She will face local favorite Zsanett NEMETH (HUN) in the semifinals. 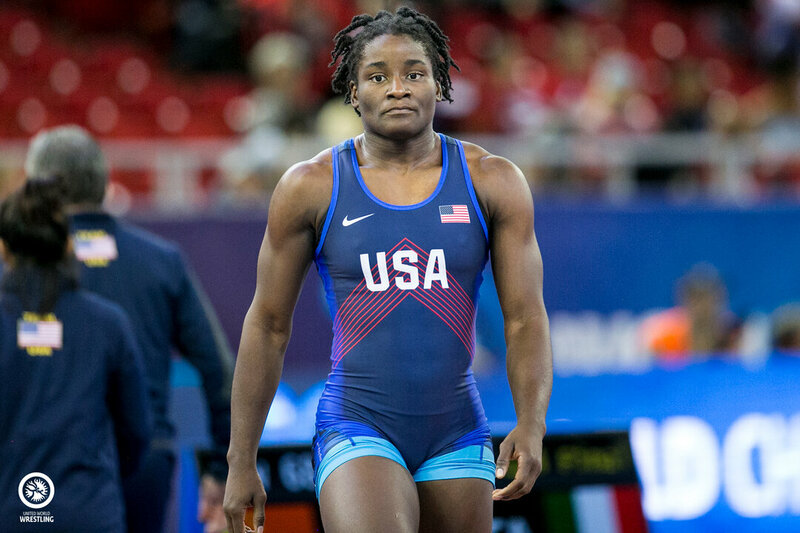 Perhaps the most impressive performance of Tuesday's opening session came from Tamyra MENSAH (USA), who dominated two-time world champion Battsetseg SORONZONBOLD (MGL) 10-0 in the quarterfinals at 68kg. Mensah jumped out to an 8-0 lead after the opening period on the strength of three takedowns. She then put the match away early in the second period with another takedown. Soronzonbold was coming off a 5-2 win over past world champion Jenny FRANSSON (SWE). Mensah now faces Koumba LARROQUE (FRA), who remains on track in her quest to add a senior gold medal to a resume that includes world golds at the U23, junior and cadet levels. Larroque opened her competition with two falls before earning an 11-3 victory over Olivia DI BACCO (CAN) in the quarterfinals. Alla CHERKASOVA (UKR) and Feng ZHOU (CHN), both past world bronze medalists, will meet in the semifinals in the top half of the bracket at 68kg. At 65kg, Top-seeded Petra OLLI (FIN) survived a scare in her first match as she snuck past Sofiya GEORGIEVA (BUL) 4-4 on criteria. She then punched her ticket to the semifinals with a 6-2 win over Ritu RITU (IND). Her semifinals opponent will be Ayana GEMPEI (JPN), a world champion at the U23 and junior divisions. Gempei cruised to a 6-1 victory in the quarterfinals over Adela HANZLICKOVA (CZE). 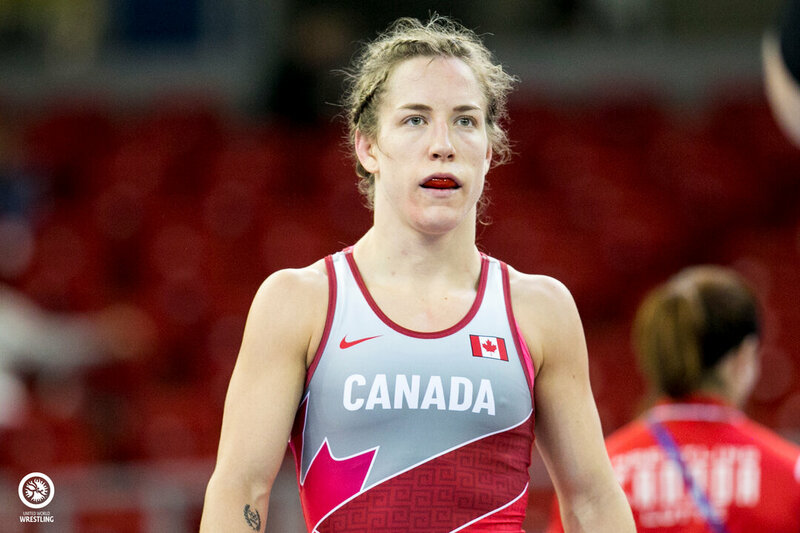 On the bottom side of the 65kg bracket, Danielle LAPPAGE (CAN), a 2010 junior world champion, picked up three takedowns en route to a 6-2 win over Forrest MOLINARI (USA). Lappage will now face Iryna NETREBA (AZE), who blanked Chuying TANG (CHN) 3-0 in the quarterfinals. Egypt has a semifinalist in women's wrestling in Samar HAMZA (EGY), who dominated Naruha MATSUYUKI (JPN) 12-1 in the quarterfinals at 72kg. Hamza is one win away from reaching the gold-medal match, but standing in her way is returning world bronze medalist Justina DI STASIO (CAN). Di Stacio is one of three semifinalists today for Canada, along with Lappage and Wiebe. Three-time world bronze medalist Nasanburmaa OCHIRBAT (MGL) edged Buse TOSUN (TUR) 7-6 in the quarterfinals at 72kg, setting up a semifinal meeting with Juan WANG (CHN). Wang has been dominant thus far, picking up two technical falls and outscoring her opponents 23-1. The semifinals will take place at 4:45 p.m. local time.